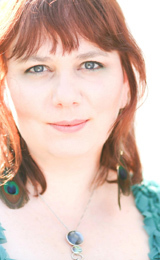 Lyrical Venus » Sue Krehbiel on Lyrical Venus Radio 10/20! I first remember seeing Sue Krehbiel on the Open Stage at Rocky Mountain Song School two years ago, she sang an awesome song she had written called No Matter What You Do and she had this amazing sparkly capo. Sarah Sample was backing her up. It was a good first impression! Sue and I both returned to Song School this year (my second year, she’s been going nearly every year since 1997 with time off for childbirth! ), and I ended up in a performance class with her. I was surprised to hear it has only been in more recent times though that Sue has stepped forward to perform on her own, thanks to the coaxing and encouragement of her friends. You wouldn’t know it – from her assured presence and beautiful guitar work both on stage and in her debut CD, Dusty Cleveland, Sue seems like a pro who has been performing for years! 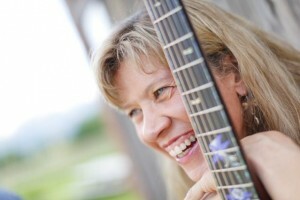 Performing might be newer to Sue, but music has been part of the Colorado songwriter’s life for as long as she can remember, starting out harmonizing with her dad at neighborhood sing-alongs as a kid. Born in Minnesota and displaced to New England (the Boston area) when she was 11 due to her father’s job, Sue later attended college in Vermont, majoring in art and became a high school art teacher outside of Boston for four years. After a fateful trip to Colorado for skiing, Sue fell in love with the state and stayed there, eventually getting married, having a daughter and opening a custom framing shop with her husband. Throughout her life though, Sue has been blessed with friends all along the way who have supported her to write and perform her own music, from a classmate in high school who encouraged her to first try writing, to the friend who gave her a wedding present of making her own CD, which she is just now releasing! So exciting! The 11 song CD was produced by another supportive friend and song-schooler, Frank Martin. From a sparkling story of her father and his childhood friends to sweet love songs, to a tales about fishing and friends growing older, Sue casts her observant eye over a wide range of life’s stories. The whole album is supported by her lovely guitar playing and filled out with back-up instrumentation from a talented cast of characters. Dusty Cleveland will be available soon on CD Baby, so keep an eye out! In the meantime, you can hear some of her songs and from Sue herself on the Lyrical Venus Radio Hour Tuesday October 20th! The show is (as always!) from 9-10 am Central and Sue will be calling in at 9:30. Tune in to KRUU-LP 100.1 FM here in Fairfield, and kruufm.com online anywhere!